Years ago a group of kiwi travelled to find a place to settle. Much later another group arrived and wanted to settle there too. Both wondered who these strangers were and they began to fight each other, until eventually they made a treaty and agreed to share and to live together.... read full description below. Years ago a group of kiwi travelled to find a place to settle. Much later another group arrived and wanted to settle there too. Both wondered who these strangers were and they began to fight each other, until eventually they made a treaty and agreed to share and to live together. 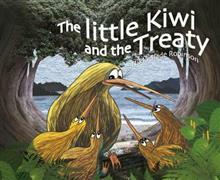 Listening to Koro's story the little Kiwi learns about identity, family history, treaties and living alongside other groups. The Little Kiwi and the Treaty is a sequel to Weka's Waiata, Ruru's Hangi and The little Kiwi's Matariki, winner of the Best Picture Book at the 2016 New Zealand Book Awards for Children & Young Adults. Nikki Slade Robinson has illustrated over sixty children's books and readers. She has also both written and illustrated a number of books published by Duck Creek Press that include the Muddle & Mo books and I Am An Artist.